Our last day in London started out on the early side, and one thing I’ve learned about London, is that coffee shops and breakfast places are not open for us early risers. Most places don’t open till 9:00 a.m. or later! Luckily, we found out about Bill’s the night before. This place is a gem among the Soho restaurant scene. Breakfast at Bill’s goes anywhere from a basket of toast and pastries with butter and three different jams, to pancakes with strawberries and bananas, to full English plates and various egg dishes, and there are plenty of options for vegetarians. The place is funky and fabulous on the inside with a décor, which must be seen and experienced to be appreciated. The music went from Reggie, to Memphis Blues, to Jazz without blinking an eye. The servers were friendly, funny, and at times entertaining as the got down to the funky music. 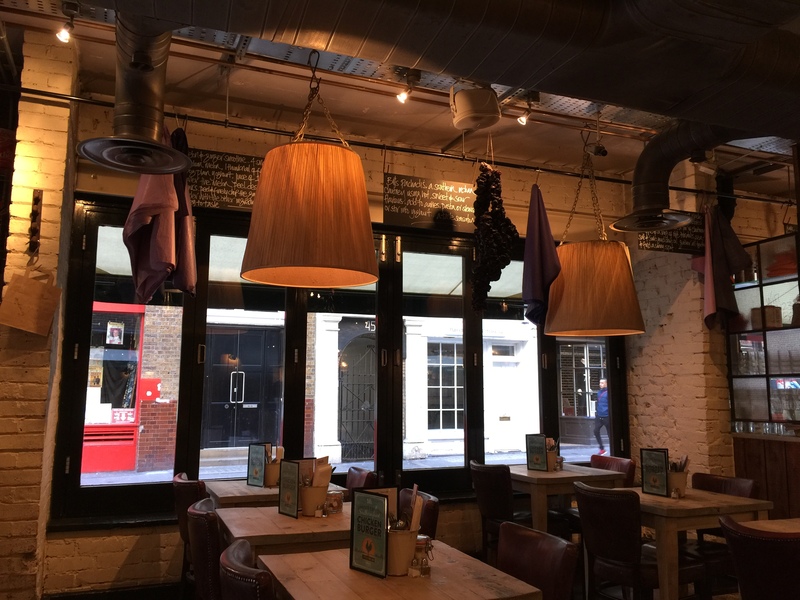 There is no London pretension here, only great food, and great service. 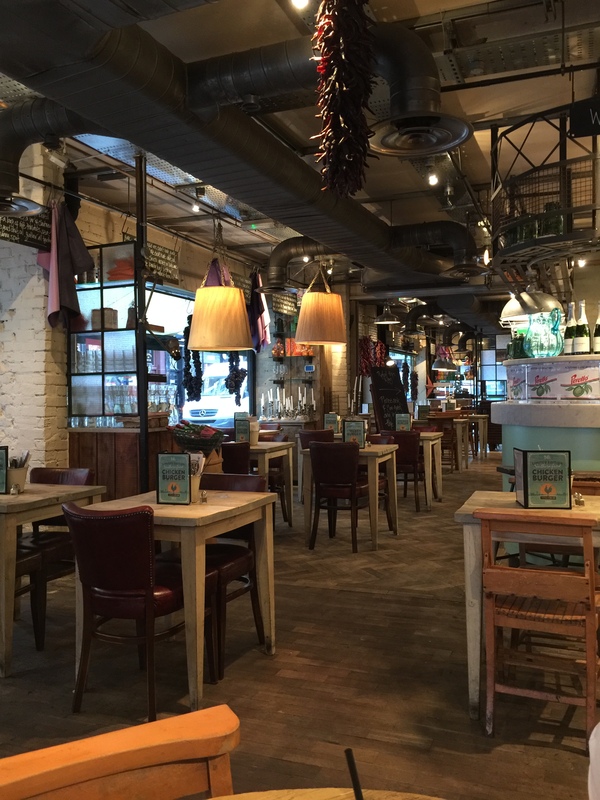 If you’re an early morning person and are up for some fantastic food, get down to Bill’s. One word of warning, they get busy and stay busy, so make a reservation. With love from my dog bowl to yours…happy eating! One of the reason I enjoy Japanese restaurants, besides the food, is their casual, quiet, and relaxing atmosphere. The hotel concierge recommended Dozo to us. 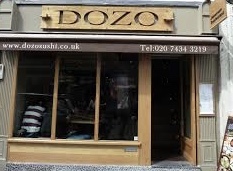 The food at Dozo was outstanding, but the atmosphere left a lot to be desired. Now to be fair we arrived at Dozo without a reservation, though to be honest there was no mention of reservations needed on their website. We arrived at 6:15 p.m. (they supposedly opened at 6:00 p.m.) and the place was packed (a good sign) but the noise and chaos of the restaurant overpowered the entire restaurant. The maître d was quite flirtatious with us, so he “found us a table” or rather squeezed us into the end of a row of tables, requiring us to sit on the floor with our legs dangling into a black hole in the floor, no I am not joking. We were packed elbow to elbow and shoulder to shoulder, and foot to foot with the crowds. It was not a pleasant dining experience. The food however, made up for the cramped quarters. The vegetable gyoza were perfectly prepared with a flavorful and tangy dipping sauce. The Kaiso salad, a mix of seaweeds, was utterly flat and flavorless and sat in a pool of water. Their sesame dressing, served on the side, was more of a thick peanut butter than a sauce. It was the disappointment of the meal. The sushi, consisting of a tempura asparagus roll, a rainbow roll, and a tuna roll were fresh and delicious. There are some basic vegetarian rolls on the menu, but other than five types of rolls and a couple of salads, there is nothing on the menu that doesn’t consist of some form of meat, fish, or seafood. If you’re looking for a Japanese restaurant in Soho, this is an option but just beware that it will be noisy, and crowded. If you’re looking for a quieter experience, go elsewhere. Sometimes when you’re traveling you need a little taste of home, something to keep you grounded while traveling, a comfort in the memory of good food. That is where I found myself during my second day in London, and the reason why I chose to go to The Diner. I checked out the menu online, and it looked authentic, you know truly American. There were numerous versions of hamburgers and hot dogs, basket combo’s of fried proteins with French fries and coleslaw. They even had blue-plate specials. Now come on who doesn’t remember those from their childhood. Plus, they had a decent selection of vegetarian dishes. I was sold. Oh, how foolish I was to think I could get real American diner food here in London. The menu may have been authentic, but the food was in the words of many Londoners, rubbish. It was as if they photocopied an American diner menu, but hadn’t a clue as to how to prepare any of the food. The tomato soup (usually one of my favorites) was loaded with garlic and onions. Blindfolded I would not have known there were tomatoes in the soup. It was watered down, thin, and other than the onion and garlic flavorless. The grilled cheese sandwich was far worse. It was wrapped in paper (as is usually served here in London with fish and chips), it only helped in holding in the grease of the cheese. The sandwich was thick, heavy, and literally falling apart from the grease. I have no idea what sort of cheese they used, as there wasn’t any cheese flavor, just bread and grease. 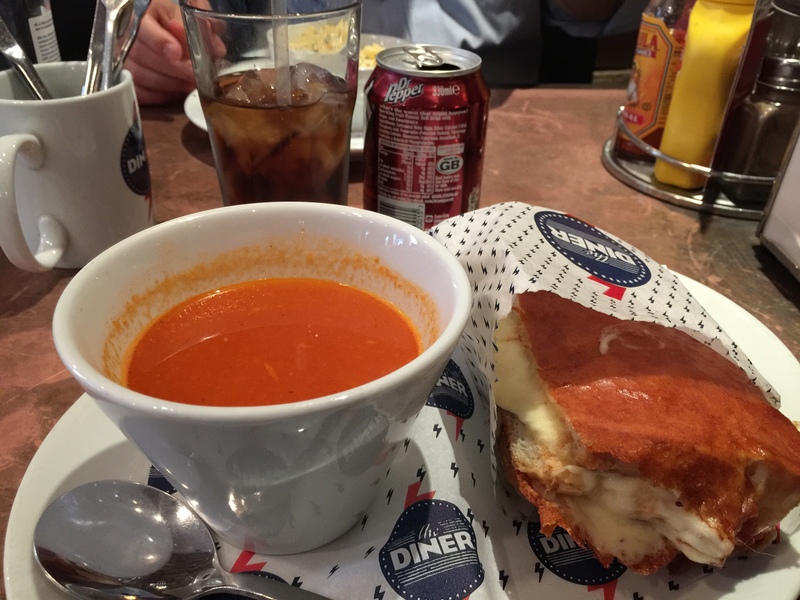 I suppose here in London, no one is going to know what true American diner food is like, but let me tell you something, nothing about the place remotely resembles it, except for the menu. 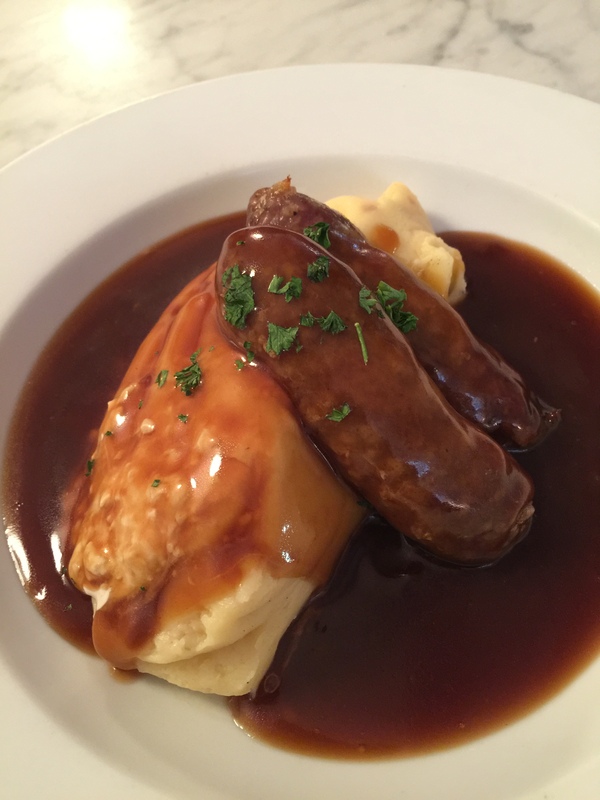 I’ve had bangers and mash in the states, and always wondered how much they actually resemble the real deal in London, well I found out. Of course both the British and American versions have mashed potatoes, sausages and gravy, but that’s were the similarities end. The flavor of true bangers and mash can’t be had in the State at least not that I have found. Mother Mash is my new home away from home. Picture it. Eight different types of mash, from horseradish, cheesy mustard and of course the classic with milk and butter. Then there are nine different types of bangers you can select from. (Yes this is build your own) from Cumberland sausages, Lincolnshire to lamb and mint, and yes for you vegetarians out there they have a vegetable and herb banger! And it doesn’t stop there. Once you select your mash and bangers then you get to choose your gravy, from traditional to veggie and everywhere in between. I selected the horseradish mash with Cumberland sausages and tradition gravy. (Pictured) From the first bite until the very last I was in doggy heaven. Word cannot describe the flavors and textures of this dish. The potatoes are whipped to a fluffy consistency mixed with a fresh horseradish sauce and bits of the horseradish root. The sausages are mild, and tangy and blend perfectly with the traditional gravy. If it hadn’t been for a full house, I literally would have licked my plate clean, that’s how insanely good this dish was. 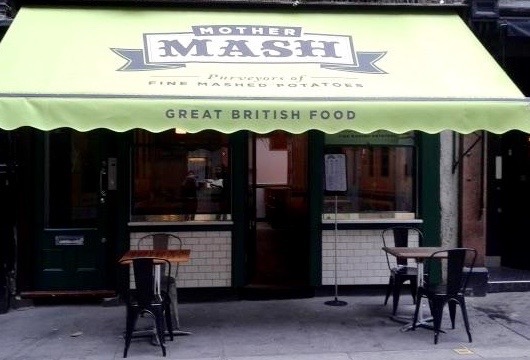 I don’t know how other restaurants prepare their bangers and mash, but at Mother Mash’s that all they do, and they have perfected the art, and yes I now know that true bangers and mash is an art form. My first morning in London, found me a bit jet lagged and surprisingly hungry. I noticed next to my little doggy bed a breakfast menu for the hotel, which stated that their breakfast came from Princi Bakery in Soho. Instead of having breakfast in bed, I decided to get myself cleaned up and go to their restaurant. And here is where the review gets tricky. The restaurant is beautifully designed open and inviting. The center of the room holds the wood-fire grill for what is supposed to be their famous pizza’s from Milan. Yes, this is a Milanese restaurant. A not so friendly waiter who seemed to be having a bad morning greeted us. After dropping off the menu, he quickly left. We waited, and waited a bit more before he returned to take our order. Once again we waited, and waited, and waited some more. The waiter had simply vanished he was nowhere to be seen. Finally a woman came to our table (after a good 20 minutes) to ask if we were okay, we explained what had happened, she apologized and immediately corrected the situation. Our juice, cappuccinos, and pastries were brought to our table. The pastries were out of the world. 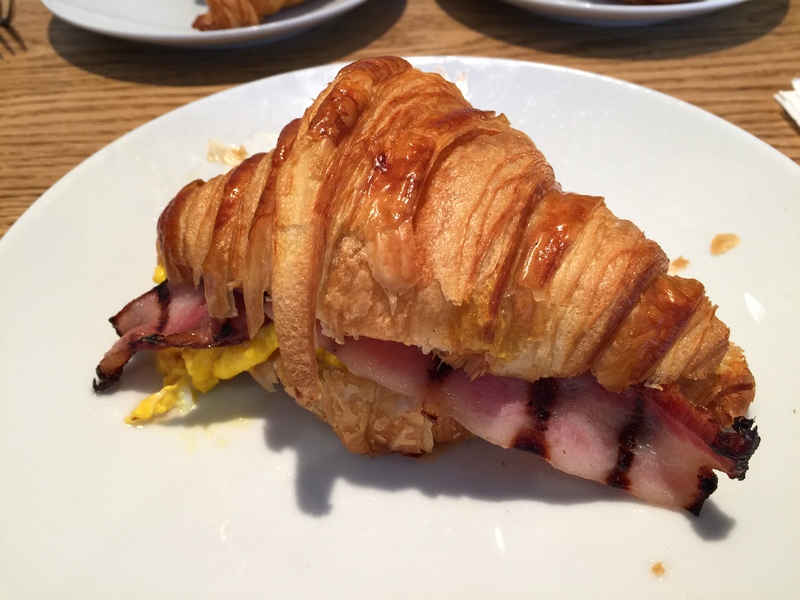 Coming from the United States where you’re never sure what you’ll get when a croissant is ordered, this was truly amazing. Now I know what true French pastries are like. During our meal, we had three other employees of the restaurant checking in with us, including the manager (I believe) and it wasn’t until the plates were cleared that our mysterious waiter with the attitude showed up. And once again after passing by our table a half-dozen times I literally had to stop him and ask for our bill. After talking to friends about this experience, I’m told that it’s not uncommon to have such dramas unfold at some of the finest Milan restaurants, so if this is true than this place is spot on for bringing the essence of Milan to Soho. If you don’t mind a bit of drama and emotional meltdown from your wait staff, then this place is worth the trip.